We offer an extensive range of products suitable for any shape or size door. Our range includes swing gates, expandable gates and bulgrar bars.All of our products are made to combine strength, design and function. They are all custom-made to suit your individual needs ensuring your maximum security. Metal carports are a popular way to protect your car, truck, RV, and farm equipment from the weather. Our metal carports come in many different sizes and styles.Cover your valuable items the easy way with a metal carport. Cafa Welding factory direct prices on metal carports save you time and money. Installation, repair and servicing of gate motors and intercom systems. We will refurbish motors, do upgrades and supply remote controls. We work on both swing and slide gates. We use only the best products on the market, and are also able to give your motor a battery backup system. 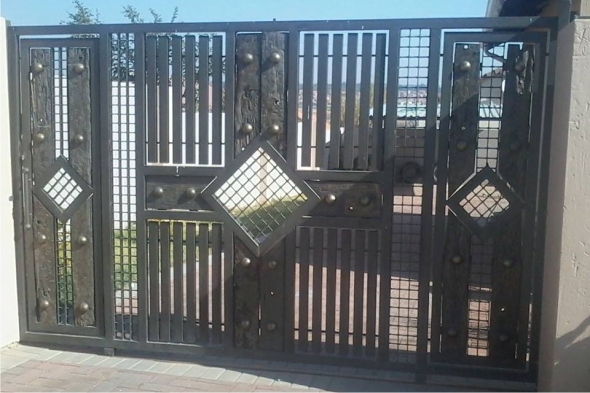 Cafa Welding offers a complete service from design, manufacture, and installation of Burglars, Security Gates, Fences and other steel Fabrications. We are with you right through to the final touch up and on completion the site is left clean and tidy. All that is left for you to do is to enjoy your new purchase.